Antoni Gaudí in probably the best known and most influential architect in Spain. He played an important role in the influence of Catalan Modernism and Art Noveau. With a unique style, never matched, his way of thinking about architecture even today are admired and have an impact in the new generations of architects. If you are heading to Barcelona you just can't miss the largest concentration of his work. 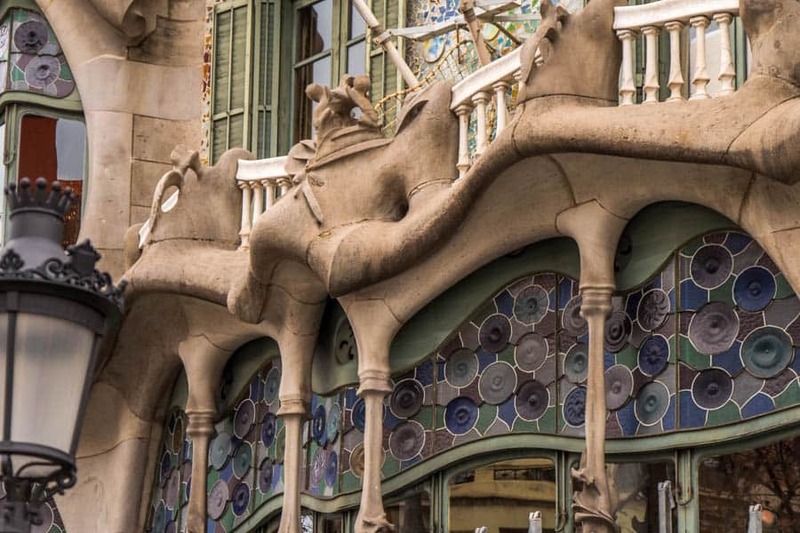 Here is some of the must see Gaudí buildings in the city. One of the most iconic and must see Gaudí buildings in Barcelona, the Sagrada Familia attract millions of people everywhere from all over the world. It’s so difficult to describe it because is one of a kind building, a masterpiece by Antoni Gaudí. The work in the Roman Catholic Church is unfinished. Started in 1882, under the supervision of another architect. But, in 1883 Gaudí took over the project, designed according to his style. It’s meant to be complete in 2026. It’s clearly visible the combination of Gothic and Art Nouveau. The artist devoted his life to this project so, when he died, he was buried in the crypt. You can visit for free but, only from 9-10hAM strictly for Mass services and again from 18-21hPM, according to the information desk at Sagrada Familia. The construction was interrupted by the Spanish Civil War and in 1936 revolutionaries set light to the crypt and partially destroyed Gaudí’s original plans, drawings, and plaster models. The plan has curved lines because according to the artist straight lines did not exist in Nature. The columns are also built in a tree-shape to support the whole monument, taking Nature as a symbol. Outside, the spires (some under construction) calls a total of eighteen spires, representing in ascending order of height the Twelve Apostles, the Virgin Mary, four Evangelists and the tallest of all Jesus Christ. Sagrada Familia has three different façades. The Nativity façade was completed in 1935, dedicated to Jesus birth and with elements related to Nature and the creation of life. The Passion façade is dedicated to the suffering of Christ during the crucifixion. The Glory façade is the largest one, still under construction, dedicated to the glory of Jesus and the road to reach God going through death, final judgment and glory. The interior is exquisite, we could not believe what our eyes wore seem. The central nave vaults reach 45 meters, if you standing at the main entrance you are able to see the vaults of the nave, crossing, and apse. Another characteristic is the gaps in the apse, providing a view into the crypt. Geometric forms are everywhere, as Gaudí reference in his work. Some of them resulting in a three-dimensional intersection. The interior surface is abstract shapes. It’s visible a Latin cross and an organ with 1492 pipes, installed in 2010. The building is full of symbolism, including words from the liturgy and areas of the sanctuary will represent various concepts, such as saints, virtues, and sins. Some curiosities about Sagrada Familia include the fact that was designed with pure and simple geometric forms for any architect understands. Gaudí also thought in each part of the Sagrada Familia to be constructed separately so that each generation of architects could bring their own style. One of the most intriguing things is a ‘magic square’. In the Passion facade, you could see a 4X4 square with 16 numbers that remains a complete mystery. Some say that if you add up all numbers horizontally or vertically is 33, like the age of Christ when he was crucified. Another explanation is that the number 33 is the highest rank of a freemason can reach as Gaudí is referred to be one. Anyway, Sagrada Familia is Unesco World Heritage Site (only the part constructed by Gaudí). The architect exceptional creative work and was influenced many of the forms and techniques in construction. A masterpiece that once in a lifetime you must visit. Casa Milà is one of the must see Gaudí buildings in Barcelona, is also one of the must visit. Is a Unesco World Heritage Site was must of the architect works. It’s was the last private residence designed by Gaudí and it belongs to Pere Milà and his wife Roser Segimon. 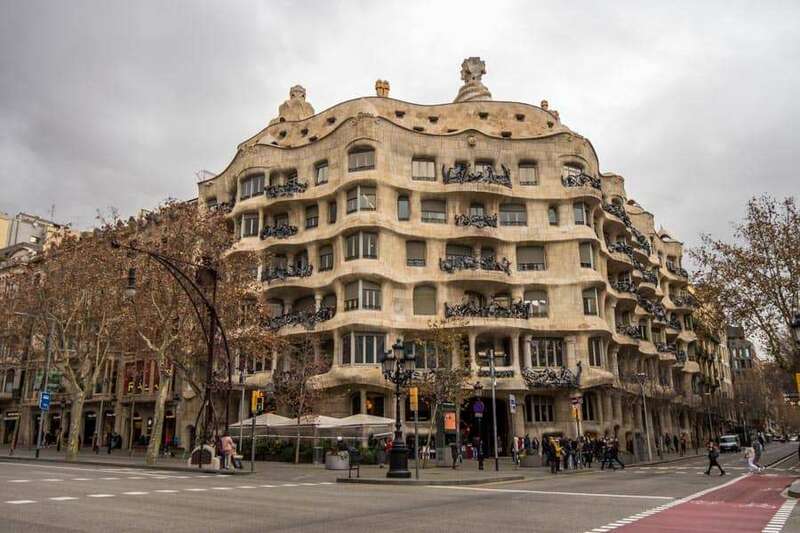 Built between 1906 and 1912 is also known as La Pedrera because of the stony undulating appearance. At the time the building was very criticized because did not respect any rules of conventional style. 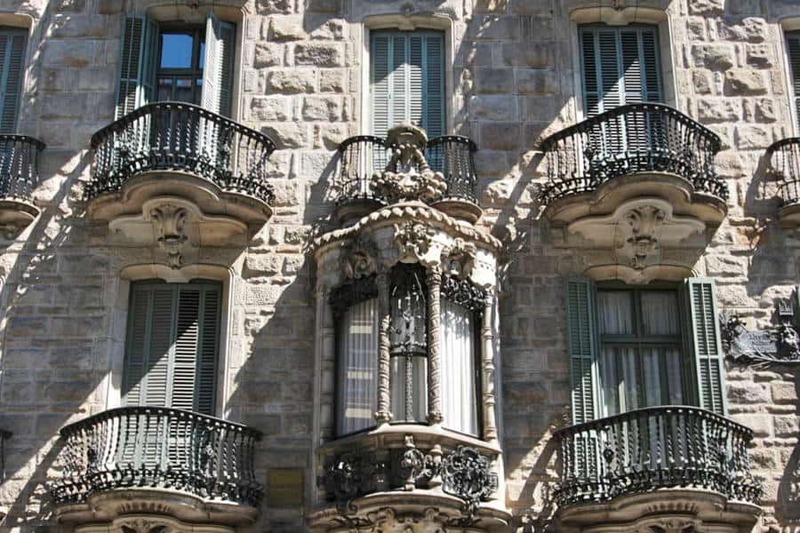 The façade has a twisting wrought iron balcony designed by Josep Maria Jujol. There’re some innovations like, a free-plan floor, an underground garage and a terrace on the roof. The roof terrace is precisely one of the highlights of the house, also called ‘garden of warriors’. The 28 imposing chimneys appear to be protecting the skylights and are decorated in a mosaic of marble, broken Valencian tiles and broken glass from champagne bottles. Gaudí also created furniture especially for Casa Milà, due to unusual design the normal furniture wouldn’t suit. Today only a few items are left. The building has a courtyard supported by pillars of cast iron with elliptical beams and girders. In the attic, you can see some of Gaudí’s designs, models, plans, photographs, and videos. Casa Milà conserved spiritual symbols of the Catholic religion, a reference for the artist. It’s possible to admire an excerpt from the Rosary prayer on the cornice and planned statues of Mary. Also, two archangels, St. Michael and St. Gabriel make a presence. La Pedrera is an exceptional piece of art that you can miss, even if you are not a big fan of this type of architecture. Since 2013 the Fundació Catalunya La Pedrera, that monitored the visits, exhibitions and cultural activities on the building was also, here the headquarters. One of the masterpieces of Gaudí, Casa Batlló in located in the center of Barcelona. Locally called Casa dels Ossos (House of Bones) because of the exterior appearance, the artist wanted to avoid straight lines. The façade is decorated with a mosaic made of broken ceramic tiles (trencadís) with the most various colours. The roof is arched and mostly believes that the rounded features represent the lance of Saint George (patron saint of Catalonia). Casa Batlló was initially brought in 1900 by Josep Batlló. A few years later, they wanted a unique piece of work and a different house from anything so, they choose Gaudí to redesign all house. The building was completed refurbished in 1906. After the initial owner passed away, the house suffered continuous refurbishments. Finally, in 1995 the current owner decided to open the house to the public, and show to the world this beautiful architectural site. In 2002, the International Year of Gaudí, cultural visits started. Casa Batlló is a Unesco World Heritage site and one of the must see Gaudí buildings in Barcelona. It’s an exquisite work and modernism at its finest. 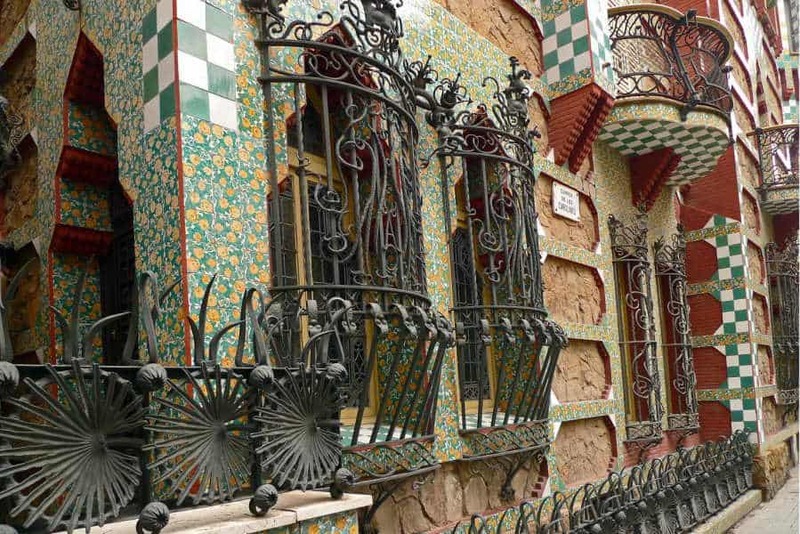 Located on the Gràcia neighborhood, Casa Vicens it was the first house that Gaudí designed as an architect. Built between 1883 and 1885 as a summer house for the Vicens family, today is a museum to raise awareness of Gaudí work. In 2014 was sold to a private family-owned bank with the compromise of an ambitious rehabilitation and restoration of the building. But, still keeping all the details of Gaudí project. Casa Vicens have an amazing rooftop with a small cupola on the western corner of the façade. Green and white ceramic tiles cover the façade, as Gaudí influence by Islamic and Asian architecture. It’s also visible the natural elements, as this is an important feature in Gaudí projects. This building is very important for Art Nouveau and was declared Unesco World Heritage in 2005. Gaudí created an innovative and original project that was completely different from anything else at that time. It was the beginning of his artistic career. Although, Casa Calvet is not famous as the other Gaudí houses it’s still impressive. It was designed to serve as a commercial property and a residence between 1898 and 1900. 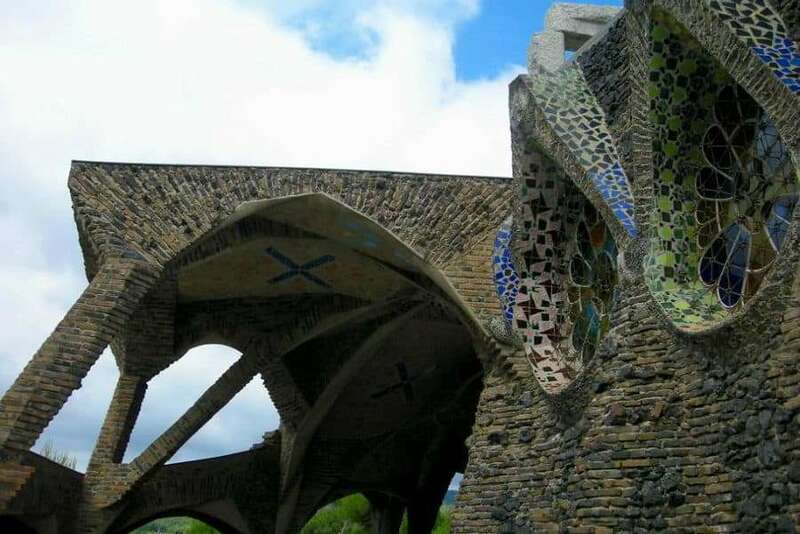 It is the most conventional work of Gaudí but, at the same time unusual for the artist work. Mainly because of the symmetry, balance and orderly rhythm. Located in between of old structures, in one of the most elegant zones of Barcelona. The Casa Calvet show us balconies alternate with smaller shallower balconies. Curves, a double gable at the top make a presence and the modernista details are opulent. The columns at the entrance are an allusion to the owner family business of textile manufacture. The gallery on the ground floor combines iron and stone with decorative historical elements such as cypress, an olive tree, horns of plenty and the Catalan coat of arms. There are three sculpted heads at the top; one is Sant Pere Màrtir Calvet I Carbonell (owner’s father) and two patron saints of Vilassar, Andreu Calvet’s home town. Casa Calvet, it is private property so, it’s not possible to visit the inside. However, you can still admire the outside of Gaudí work or enter the ground floor in the chocolate shop and the restaurant. Park Guell is an intriguing architectural place, influenced by Art Nouveau and Catalan Modernisme movement. With a lot to see you will have to reserve a few hours to explore everything. The park was built between 1900 and 1914 and initially part of a commercially unsuccessful housing site. The place was a natural park on a rocky hill with vegetation, a few trees and a large country house called Larrard House. Gaudí and Eusebi Guell wanted to conceive a luxury residential area taking advantage of nature. But, only two houses were built and none of them designed by Gaudí. The architect brought one of the houses and moved in with his family, lived there from 1906 to 1926. Today this house is the Gaudí House Museum. The park was later converted in a public space. Right at the entrance, you will have the Casa del Guarda, today is part of the MUHBA (Museu D’Història de Barcelona). The most visit part is the Monumental zone (not free), very touristic so you will need to get there early. The staircase decorated with colourful mosaic (trencadís) includes a series of sculptures; the famous salamander is one of them. Right above, the Sala Hipostila with 86 slightly sloped columns gives us the idea of grandiosity. The roof is composed of small domes with colourful decorations. The upper part of Sala Hipostila is the Plaça de la Naturaleza and is currently under restoration but, you can visit anyway. From here, the views of the city are breath-taking. A colourful bench surrounded the area and was projected by Josep Maria Jujol, a Gaudí closest collaborator. On the other area, you can find the Laundress Porch, a stunning colonnade structure. Used to be the gardens of Casa Larrard, right on the side and since 1931 converted into a school. The Austria Gardens got the name because of a donation of threes from Austria in 1977. You can admire two houses, the Casa Trias, a project from Juli Batllevell and the estate show home from Francesc Berenguer. Outside de Monumental zone and in the central part of the part is located the Pont de Baix, a bridge that connects to the other parts of the park. Also, you will see more two viaducts, the Pont del Mig and the Pont de Dalt. They are suspended in slopping columns and vaults made from unhewn stones. We love Park Guell, most of the areas are free only the Monumental Zone is paid. So, you can enjoy the park very well but, we think it worth the money in that area. Eusebi Guell, an industrialist, politician and patron of the arts at the time, wanted that Antoni Gaudí design and built a unique urban palace, for his family home. So, the magnificent palace was born, to serve the family needs until they moved to Park Guell. The construction took place between 1886 and 1888. In this building, space and light is the main focus. 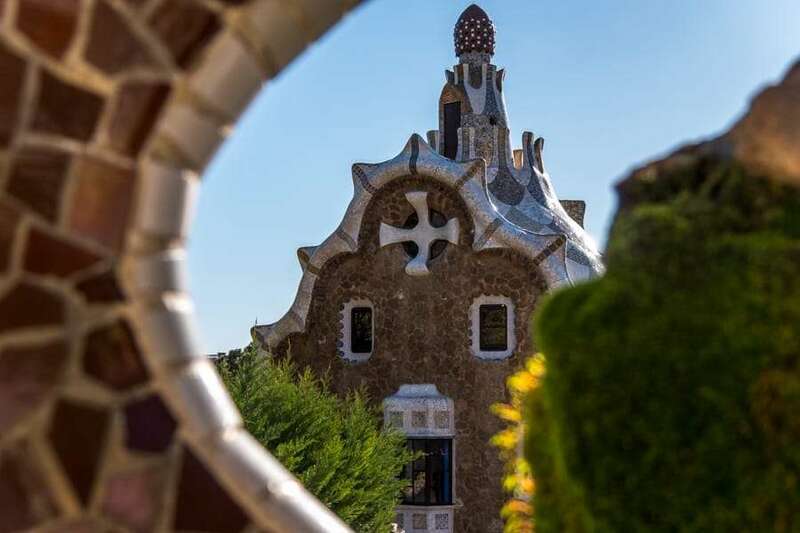 Using materials such as stone, wood, wrought iron, pottery or glass, Gaudí imagination was put on the line to create a place with expressive forms. The main room is stunning, with a high ceiling with holes on top where you can see lanterns hung at night, give an appearance of the starlit sky. In the interior, you can also see, splendid marble columns, roof covered in wood and marquetry and the colourful irregular mosaic fragments popularized by Gaudí. In 1969 the Spanish Government declared this building a historical-artistic monument and later in 1984 a Unesco World Heritage Site. Some curiosities about this place are that it was used for the filming of The Passenger from Michelangelo Antonioni. Although not so touristic as others, definitely it's one of the must see Gaudí building in the city. An unfinished work by Antoni Gaudí, built as a place of worship for the people in a manufacturing suburb near Barcelona. It’s also called Church of Colònia Guell. The Colònia Guell was an industrial colony, housing the workers of Eusebio Guell business. He wanted to improve the social conditions of his workers and applied his cultural patronage in the Colònia. At the time Gaudí was given total freedom to complete the church but, the Guell family cut the funding in 1914 forcing the artist to leave the massive project. The architect though in a structure with 40 meters high central dome but, during that time, only the lower nave was built which made up the church’s crypt. In 1915 was consecrated by the Bishop of Barcelona and a couple of years later, the roof was finished by another architect. In 2000 suffered refurbishments for touristic visits. Now, it’s possible to walk up to the roof. Gaudí once said, if the church was finished it would have been a ‘monumental model of Sagrada Familia’. Although is outside the city, this is a remarkable work from the artist and sometimes underrated by tourists. 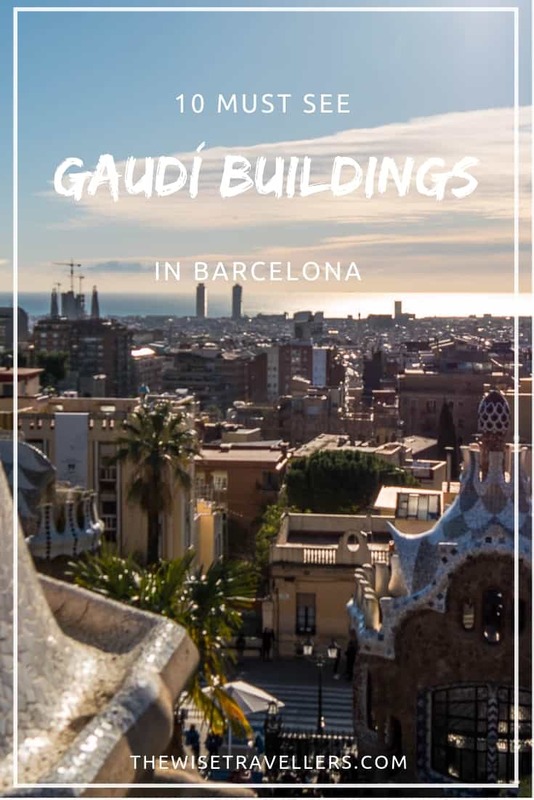 You just can miss it, because it’s definitely one of the must see Gaudí buildings. A work carry between 1888 and 1890, Teresian College is not one of the most popular Gaudí projects but, you just can't miss this lavish building. 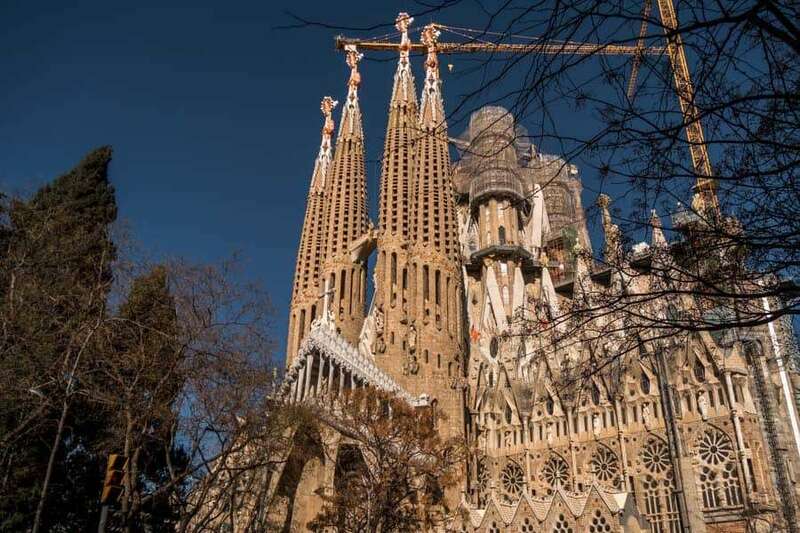 Initially, the project wasn’t for Antoni Gaudí but, Father Enric d’Ossó, founder of the Company of Saint Teresa passed the work for the architect. What is more impressive is that Gaudí was a tied budget to this project because of the financial retains of the congregation. The artist managed to complete this is a short period of time and the result as amazing. 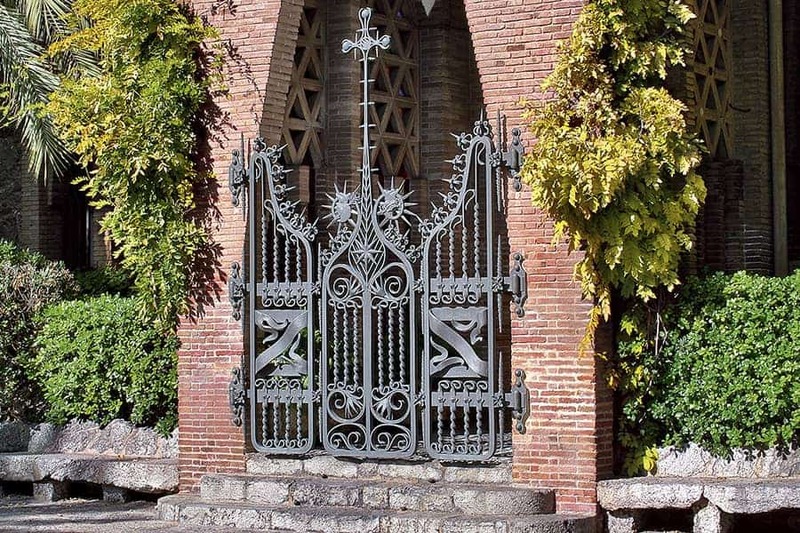 The entrance has a parabolic arch formed with two rows of advanced bricks, with a superb three-sectioned iron gate decorated with Teresian order symbols. In the tribune above this space, you can also see a ceramic rendering of the Carmelite coat of arms of the congregation. With a rectangular ground plan, the towers on the four corners give a medieval air. Gaudí always wanted to provide meaning to the decoration of his projects, so this one is full of symbolism about religion. 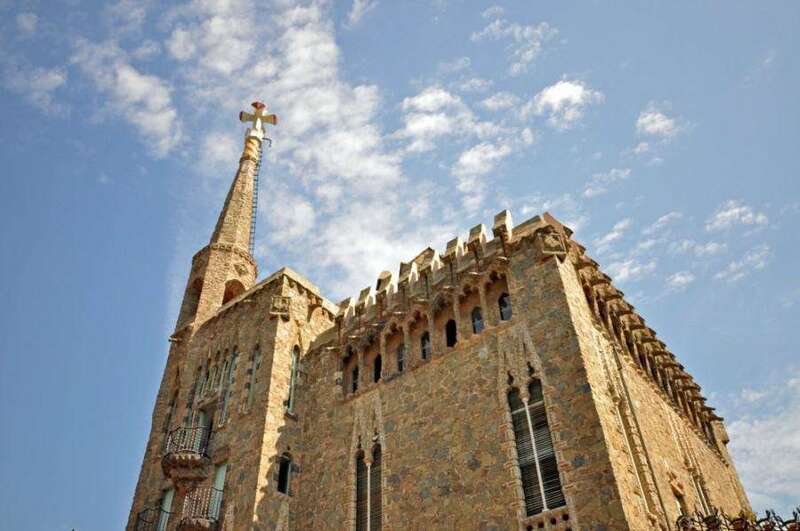 Teresian College is one of the lesser known works of the architect but, the dazzling place makes us include it in one of the must see Gaudí buildings in Barcelona. But, unfortunately only the outside, you can enter because still have the same purpose as that for which it was designed. There’re special events from time to time like, open days, and you can gain access to the inside. Is locally refer to as Casa Figueres and was built between 1900 and 1909. The building has so much history. It was the house of Martin I, the last king of Catalan dynasty. 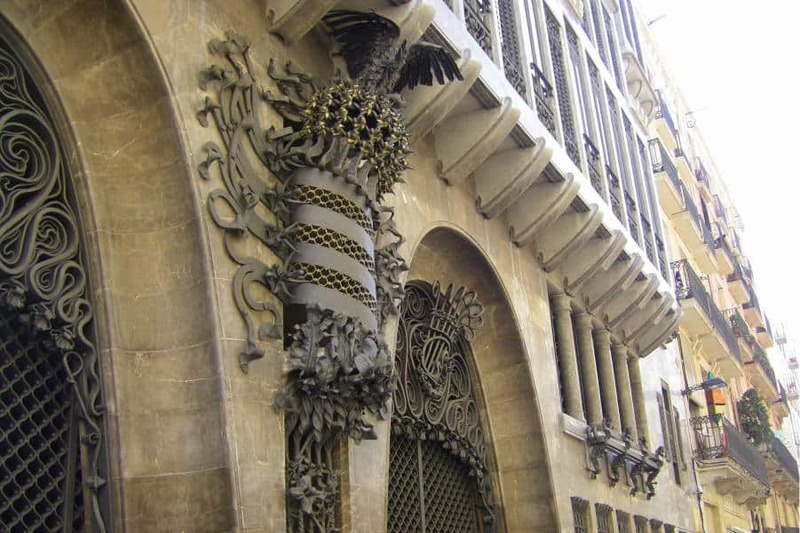 So, Gaudí took inspiration in this historical fact and project a castle that blends Art Nouveau and Gothic style. The ruins were restored and now it’s part of the estate’s grounds. The name Bellesguard it’s because of the strategic position and a view, in Catalan means ‘beautiful views’. The Bellesguard house has rectilinear forms, not very common in the artist work. The exterior is mainly stone and brick, displaying Gaudí’s typical cross of four arms decorated with red and yellow mosaic to represent the Catalan flag. In the entrance, one old inscription and above the door is an elegant stained glass window in the form of the 8 pointed star of Venus. Gaudí made use of the natural light, imposing many windows. The ceilings are Catalan arc, with layers of bricks and in the terrace a dragon, part of the tower base. The roof also resembles a dragon tail. In a garden the Crown of Aragon’s shield with two engraved dates, one represents the original castle (1409) and the other, the year which Gaudí work was complete (1909). The architect used Bellesguard Tower to try out some of his most characteristic structural elements, later used in other projects as the Sagrada Familia. The area has some of the most amazing views over the city and the sea. The Guilera family are the current owners and still live in part of the house. Barcelona is a city full of surprises. There're so much to see, and the architecture is marvelous. Did you already visit Barcelona? What did you like the most?